What did you have for dinner 2nite??? Ok this wasnt last night it was Fri night but had crab au gratin with grilled vegetables, garlic mashed potatoes, and charbroiled oysters from Don's seafood in Houma LA. Delicious highlight to a really long weekend. Last night we had farfalle with 3 different kinds of peppers, mushrooms, garlic, more veggies, all in some light white sauce/wine/olive oil. Good parmesan on top. It was fantastic. Weeze cooks good. They had blue marlin on sale at my local grocery, never had it before. On the fish guy's recommendation, I made it Carribean Jerk style. Texture much like a swordfish steak, but a bit more "gamey". Doubt I'll make it again...unless it's on sale again. 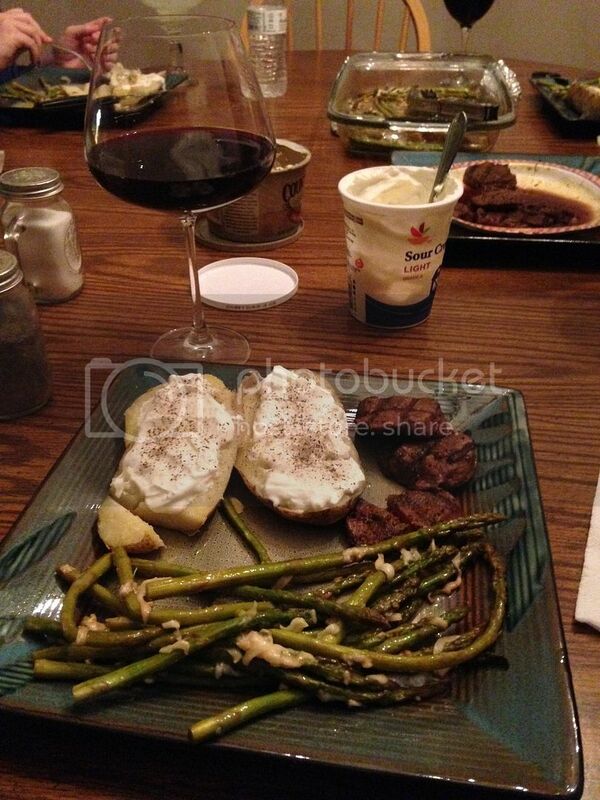 Baked potatoes, asparagus, venison back strap (my buddy got with his bow this week) and some home made port style wine! Delicious!! Fresh tilapia marinated in soy sauce, honey, garlic, and lime juice. Pan seared. Sous vide turkey breast, gravy (made stock from carcass), roasted broccoli (tossed with rendered turkey fat from skin), skin cracklings. Love my new toy. Cornbread... Ain't nothin' wrong with that. Gochujang glazed, grilled lamb flank steak over stir fried sugar snap peas, onion, red bell pepper and pickled garlic scapes. Pea shoots and chopped mint. It won't be delivery, it'll be DiGiorno. Cedar planked King salmon with fresh tarragon. Making some of my steak chili. Sirloin was 6.59 a point and prime rib was 7 a pound so I got 1 1/2 pounds of the rib, had them trim it up and substituted it for the sirloin, then got some ribeye (for the flavor) to add to it, very tasty batch! Went to our small town festival and I had a fried walleye sandwich. The wife got a hand pounded pork loin sandwich. We shared some deep fried pickles also. Don't tell my doctor! My folks are visiting and they'd never had fried turkey. 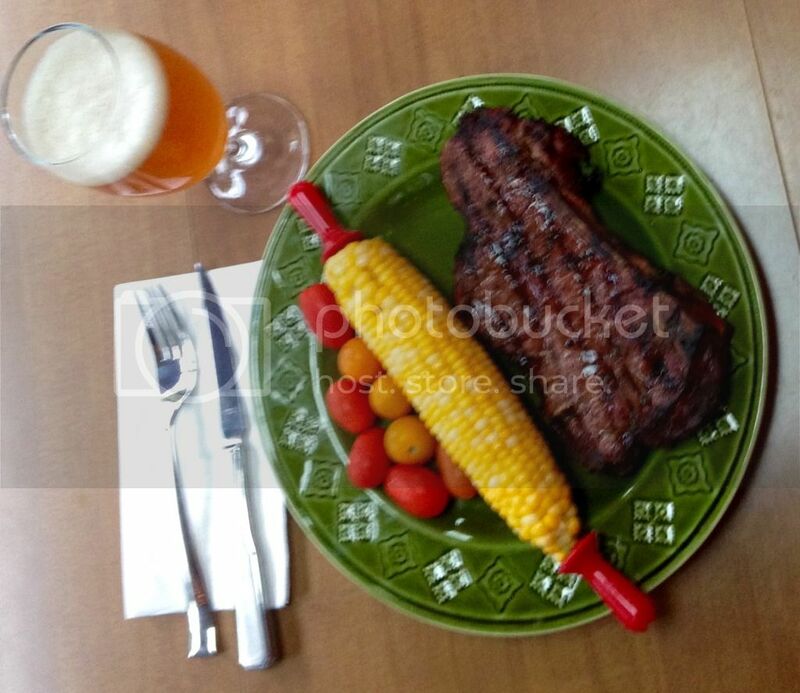 Reverse-seared steak on the Big Green Egg, corn on the cob, and cherry tomatoes. Surly Todd the Axeman IPA on the side. I only ate half the steak; I'll have the rest tomorrow.